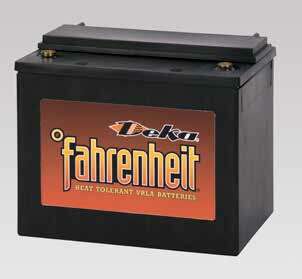 The Deka Fahrenheit HT30 features a breakthrough heat-tolerant VRLA monobloc battery design that survives up to 3X longer in temperatures of 60°C, far beyond the life of a normal VRLA battery. Rating: 28.2 Ampere-Hours @ 8 hr. rate to 1.75 V.P.C. Case/Cover: Flame-retardant, polypropylene – UL 94 V-0/>28% L.O.I.